Understanding power is crucial when examining social interaction and social order. The question of concrete power components is relevant in every society. Without such a question a society can not be understood. An analysis of the power theories of various social scientists shows similarities and differences. Let’s start with the definitions. Power can be defined in several ways. This is related to the respective scientific perspective. For example, there is a psychological, political, legal or economic perspective. Here the sociological perspective is pursued. Often in this context, the question is discussed whether power is good or bad. Such a question is not a focus of this analysis. An understanding of power structures is also the key to understanding society. Power can be exercised by different actors. Actors can be individuals, organizations, companies, states or other entities that operate within different frameworks. The organization of a society shapes the social order and thus powerful or less powerful influence of different actors. The research by Nicole Bogott and Branko Woischwill suggests that there are three factors that shape power: knowledge, networks and resources. Actors should consider these factors to gain or maintain power. Foucault, a French philosopher and social theorist, has emphasized the aspect of knowledge. Clegg, an Australian sociologist, also focuses on the knowledge perspective. Galbraith, a North American economist and author, also emphasizes the relevance of skills needed to acquire status and power. The importance of networks is mentioned, for example, by Clegg and Machiavelli, an Italian politician, philosopher and author. Weber also points to the relevance of social relationships and the associated opportunity to establish positions of power. Luhmann, one of the most well-known German sociologists, analyzes communication within networks in order to gain influence. Galbraith mentions the relevance of resources for the acquisition of status and power. And Arendt, a political theorist and philosopher, is another author who has analyzed the aspect of resources in her books. Furthermore Machiavelli mentioned in his very famous work „The Prince“ the importance of owning resources. At the same time, he demonstrates the importance of establishing specific relationships and using relevant knowledge to become a powerful person. In order to understand the foundations of power is vital to define those three terms (knowledge, network and resources) and and use a coherent model to show how these factors are related to one another. 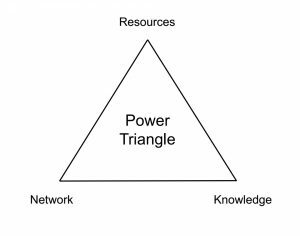 The research of Nicole Bogott and Branko Woischwill suggests that power is built when all three factors are used together with a coherent model: the Power Triangle Model. The Power Triangle (Figure 1) illustrates the foundations of power structures. In addition, the model allows different actors in different contexts to evaluate their own power and gain a deeper understanding of their own sphere of influence. When evaluating the three factors – knowledge, network and resources – it is important to realize that all three factors need to be expanded simultaneously to expand your own sphere of influence. It is necessary to steadily increase each of the three aspects. This means, for example, that just focusing on a stable network is not enough to improve the state of power, while neglecting the other two elements – resources and knowledge. Therefore, a reliable assessment is needed to avoid imbalances and to seek a harmonious complement. Such an assessment must be based on proven scientific methods (e.g. surveys) that contain results based on the self-image and the external assessment of the actor. One aspect of this theme highlighted in this seminar is communication. Communication is a skill needed to build and promote networks. Communication is also a channel through which an actor can convey concrete knowledge, e.g. give a speech, publish an article or discuss topic-specific issues. Communication is essential to show resources. For someone to gain influence, others need to recognize what resources this actor has. And therefore it is important to choose the right communication method to convey this message.